When starting the quest for Vigo faucet reviews, we decided to look at features first. While comparing to faucets, we had a question and needed to take to customer service. They were happy to answer with a live chat, which is so convenient. Besides great customer service, the faucets have excellent features that were explained in detail. Here is our compilation of Vigo faucet reviews for you to compare. 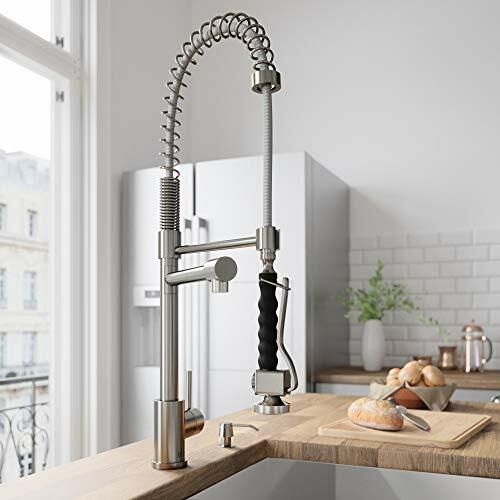 Whether you are looking for an industrial style or one that is more ‘homey’, there is a Vigo faucet that will fit in your kitchen. Read on for the complete reviews of Vigo’s most popular faucets. For an industrial look with a smaller scale, try the VG02001ST. This faucet is very similar to it larger VG02007ST big brother but packs the punch into a more compact size suited to the average sized household kitchen. With the savings in space, you also save money, making this a better fit for those with a tighter budget that wants the same ‘wow’ factor. What isn’t downsized is the features, with the stainless steel finish options and 360-degree swivel being on par with the larger model. The ceramic disk cartridge works just as well, and they both have the same flow rate of 2.2 gallons per minute. You’ll also find that the smaller model is easier to maneuver than the larger model, simply being that it’s more lightweight, and therefore physics work in your favor. This faucet does not come with a pot filler like the larger 2007 model. Some consumers also reported that with its size, it was hard to get a pot under. You may find yourself having to hold the sprayer to fill up pots. One setup we saw had a nifty water purifying spout to the side that was used for drinking and filling pots. (If you are already looking at water filters, this could be a good alternative.) This model also has reports of problems with the sprayer sticking and not wanting to switch between spray and stream. Vigo is normally happy to replace parts quickly, but if you don’t feel like waiting at all, one consumer suggested spraying it with cooking oil. Apparently, it fixed the problem immediately. The last major complaint I found is that this model wasn’t retracting. If installed according to the instructions, though, the weights should work properly every time, as other consumers stated. 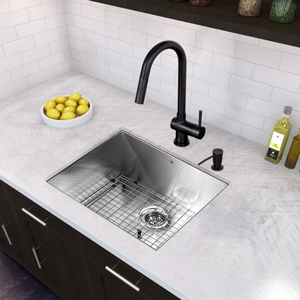 The 2007ST is a commercial style faucet that translates well into family life. This faucet has numerous uses. When sifting through consumer reports, we found that its benefits range from coercing the kids to rinse their dishes because it’s ‘cool’ and fun to use to bathing small dogs and babies with the sprayer (seriously, try it). Imagine the photo op of twins bathing in a bath with this sprayer in the background… then years later those same twins rinsing off their dishes without being told 5674883625 times. I know you, moms, out there (especially twin moms) can see the beauty in that like we do a Faucet Mag. With its 360 degrees swivel and optimal maneuverability, it can also help mom blast baked-on food off those pesky pots and pans. It also has a ceramic cartridge that helps minimize drips. Constructed from solid brass, there is a quality in workmanship that extends from the brass core to the brushed finish that consumers love. Another bonus to this faucet is that the pot filler and sprayer can both work at the same time, unlike other some of the competition’s comparable models. A few consumer reports were made complaining about this faucet leaking. This is repeatedly found at the two-year mark. One person even reported it flooding the kitchen because the main valve was left on and it burst under the pressure. Let me first state that it is recommended that the main shutoff is turned off when not in use to help prevent this. Most reported that customer service was very helpful and that they sent a replacement quickly and at no cost to the customer. One long-time owner said that they had replaced it twice in five years, but also stuck with the faucet because the customer service was so good and they simply loved it. 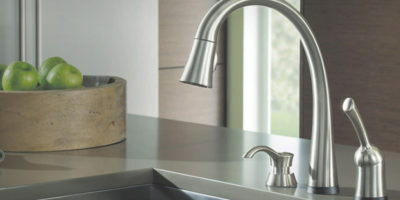 The VG02011ST is a modern and stylish faucet with a pull out style sprayer. This faucet comes with a stainless steel finish that is resistant to corrosion and tarnishing, that also wipes clean easily. It is well made, and one rave review after another reports that it is solid and sturdy. It has also been called elegant and has a low profile for those that prefer this over height. This faucet looks wonderful under a window where taller faucets would obscure the view. Unlike competitors’ similar faucets, the sprayer head for this model is made of metal. Plastic sprayer heads can crack and wear much faster than metal ones, which is not a problem for the VG02007ST. This feature alone would be a huge selling point to many customers, but to Vigo, it is simply a part of the durability of this faucet. This faucet is known to continue pouring for a few seconds after the tap is turned off. This is presumably because the hose is clearing out. It almost seems unavoidable but isn’t as horrible as a constant leak or drip. 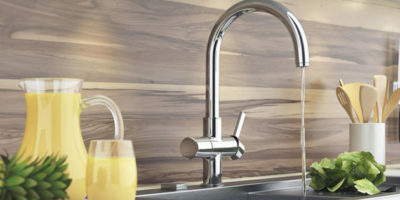 With the extra parts and connections required for a pull-out faucet, there is always more risk for leaks and defects. However, as already mentioned, Vigo is normally happy to replace parts if necessary, from the whole faucet itself down to the smallest O-ring. The metal sprayer found its way into the pros for being durable and sturdy, but this can also be a con. The problem is that that the sprayer is a bit heavier than the average sprayer, which takes some getting used to. Similar sprayers are usually made of lightweight plastic. It’s really a matter of preference on this point. Some would say that dealing with the weight is a small price to pay for such durability. 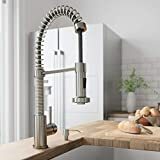 The Vigo VG02008ST Savona Kitchen Pull Down Kitchen Faucet is beautiful and simply designed pull down faucet that demands attention, but fits nicely even in compact kitchens. The Vigo VG02008ST Savona Kitchen Pull-Down Kitchen Faucet has tons of cool features that you will find useful in your home. It has a single function pull-down sprayer that is easy and fun to use. The solid brass construction means that this faucet is durable and will last for years. You may not ever even have to purchase another in your lifetime unless you decide to upgrade later. 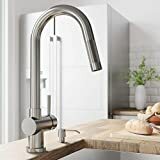 Plumbers say that it is a great value for the construction, though this faucet is so easy to install you may find you need not even call the plumber around (or pay them even) for this faucet’s installation. With it’s single- lever water and temperature control, the Savona is also easy to use and can be operated using only one hand, and only one finger from that hand. It’s 360 degrees swivel allows for maximum reach of the spout, and the pull-down sprayer extends that reach up to 30″ in reach. The main complaint about this sprayer is that it does not have the options of spray or stream. You will go without the shower- type stream with this model. A good number of people do not consider this to be a con, though, as in the past the standard sprayer had only a stream function, and we all remember how horrible and unreliable those things are (though it was fun to band the sprayer to trick someone by spraying them). 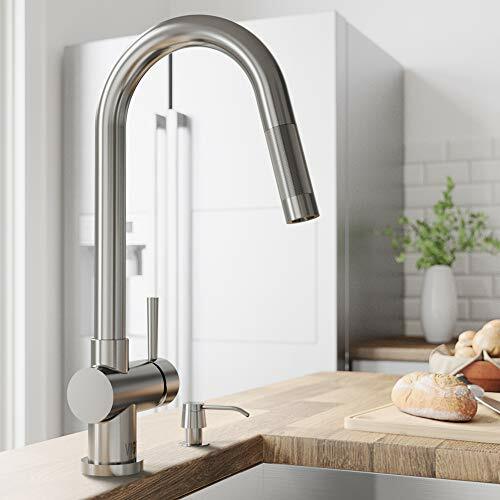 If you prefer a similarly minimalistic designed model with the options of spray and stream, consider the Delta Trinsic with Touch2O that has the added benefit of being turned on simply by touching the faucet. Vigo has excellent customer service and offers a limited lifetime warranty for all of their faucets. Their customer service actually begins with their eagerness to answer questions you have about products, and they even offer a live chat feature on their website. They are quick to replace parts when necessary and have even been known to replace parts out of warranty. All of their faucets come with all hoses necessary to install, and have clear instructions that are easy to follow. Even inexperienced plumbers (read: customers who are installing a faucet for the first time) were able to install with just a few hours work. 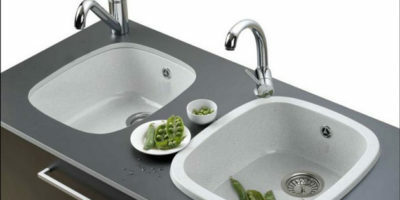 Those that preferred to hire out all report that the professional plumbers were quite impressed with the construction and performance of the Vigo faucets. Vigo has been featured on both DIY and HGTV television channels, for use in remodeling shows. Although the show ‘Bath Crashers’ (“Too Many Toilets”) featured bath products, their design, and function that caught the eye of the producers can also be found in their kitchen faucet offerings. 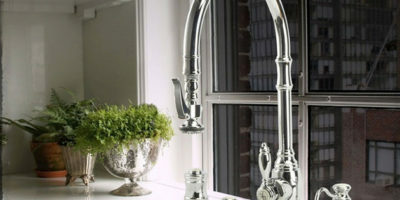 Though no Vigo faucets made Faucet Mag’s top list of kitchen faucets, they are headquartered in the US and boast being one of the fastest growing kitchen and bath product companies in the country. Vigo has an impressive line- up of kitchen faucets. They offer two faucets, the VG02007ST with a nifty pot filler, and the most compact VG02001ST that also boasts a significantly smaller price tag. 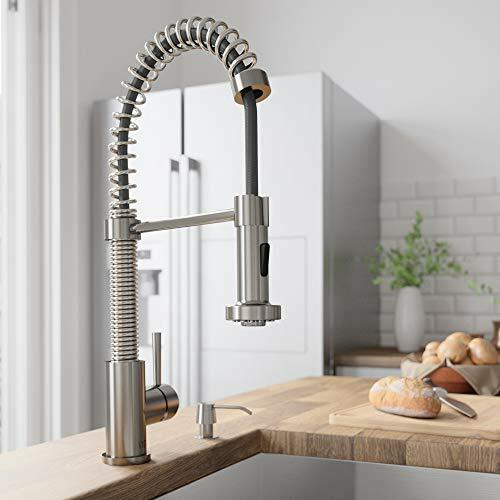 Whether you want to go big, or need something to fit nicely in your kitchen (or budget), Vigo has an industrial style faucet for your kitchen. 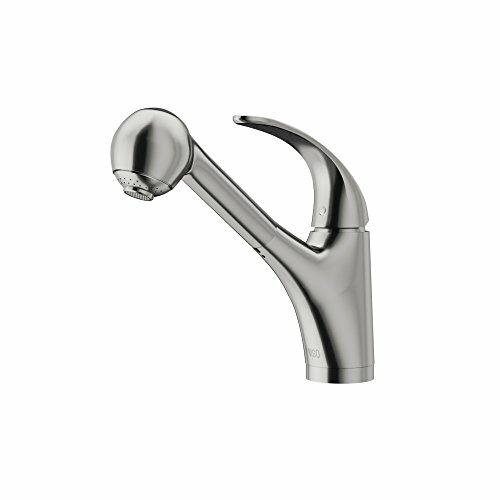 The VG02011ST is unique in the pull out faucet category, with a metal sprayer rather than the standard plastic one that competitors favor. This one is also a better fit for a when a lower profile is needed such as a space below a window or with overhead cabinets. We at FaucetMag also find their limited lifetime warranty to be pretty inclusive and their customer service to be excellent. (Did we mention the live chat?!) 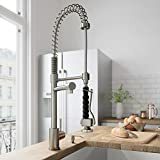 We sincerely hope that you find this Vigo faucet reviews helpful and that you have a clear picture of which faucet would be the best fit for you. I just installed a Vigo Faucet purchased from Ace Hardware. The installation was simplistic! Easy to follow dirctions. I have replaced two Delta kitchen faucets in the last year. I am now a Vigo believer!! !